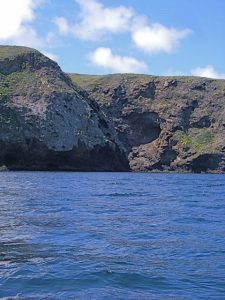 Though Painted Cave is the focus of many excursions to Santa Cruz Island, it is definitely not an anchorage. And therein lies one of two big problems. (1) There is no place to moor within paddling distance (unless you’re an olympic paddler). Folks making the run in a dinghy with a motor generally drop the hook at Hazards. (2) It’s tricky to find the cave the first time you go looking for it. Even though it is the number 2 or 3 largest sea cave in the world. Painted Cave is a few hundred yards from Profile Point … nevertheless, hard to find the first time you try. Our solution to the number one problem was to launch and retrieve the dinghy underway. The artist David Gallup and I spent an hour and half in the cave while the bosun drove Sancerre in lazy circles, waiting for Dave to complete his canvas. Profile Pt looking east. We’re very close to the entrance of Painted Cave. 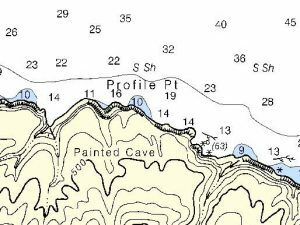 The first time I went looking for Painted Cave (this is the #2 problem), I found – what I now know – is FALSE painted cave. It’s a huge cavern a couple of hundred yards west of the real thing. It’s enormous, but it’s hard to know if it’s painted as once you’re inside and around the first bend, it is absolutely dark. 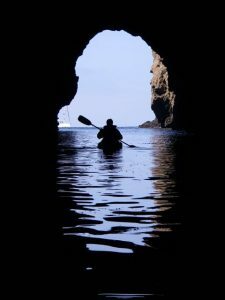 BTW, there are many caves in this area suitable for kayaking. Beware that some are fairly low and would be dangerous in any sort of swell. Anyhow, back to finding the cave. 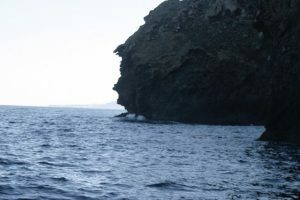 Fagan tells us that the cave is in the second indent west of Profile Point. And so it is. (The Coast Pilot says it is .3 miles east of West End. It is not. It’s 3 miles east). The trick is identifying the first indent. It’s right there, just a few yards away from Profile Point. And the Cave, well, it’s closer to Profile Point than a peg to first base. It’s only tricky to find because it’s only visible once you head into the passageway that leads to the entrance. There is, we now know, a great landmark to guide you and it’s in the picture to the right. The “bullet hole” in the middle of the cliff is the best landmark for finding the cave. Everything about this mission seemed a bit hazardous. We launched the dinghy while underway. 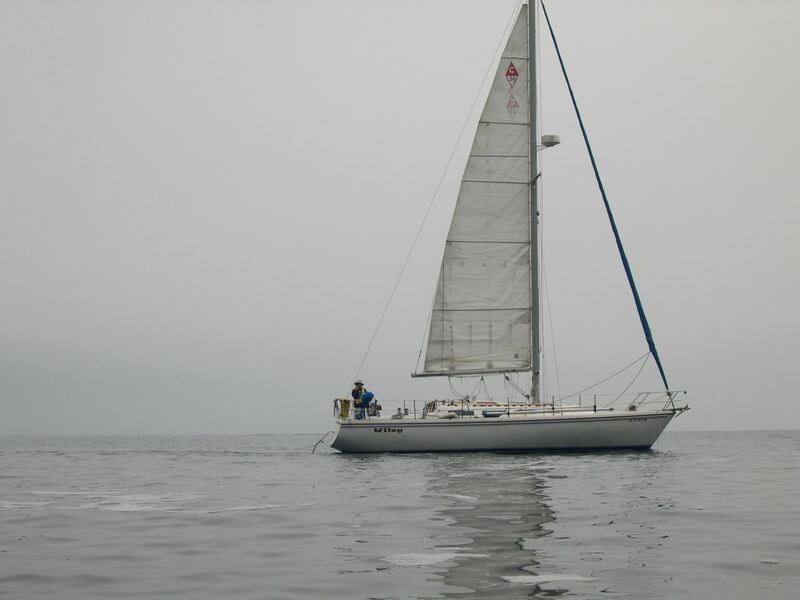 We managed to keep the dinghy upwind or crosswind from the boat, so we didn’t asphyxiate ourselves, but there was that opportunity. 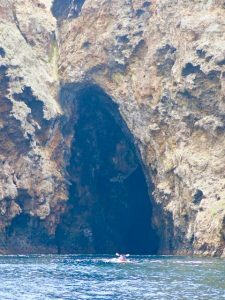 Once we got into the cave, there was an occasional swell, so we stayed in the main chamber with Dave. Had the swell increased by a foot or so, we would have bailed out. Retrieving the dinghy was a bit more interesting than launching it as the wind and sea had got a bit sportier. We had originally planned to grab some lunch and head back into the cave after that, but decided that it was getting a little to testy for us middle-to-old gentlemen. 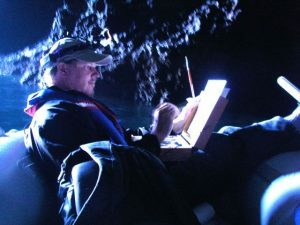 We’ve been back a couple of times, the last time in our kayaks and armed with a great flashlight. The video recounts that adventure. If you have new or amplifying information concerning this Harbor or the surrounding area, please contact Captain Dan.